...Bill Miller is the “featured artist” at Art Gallery of Viera for the month of December, providing a shopping opportunity for unique [one of a kind, no copies] finely crafted wood pieces. 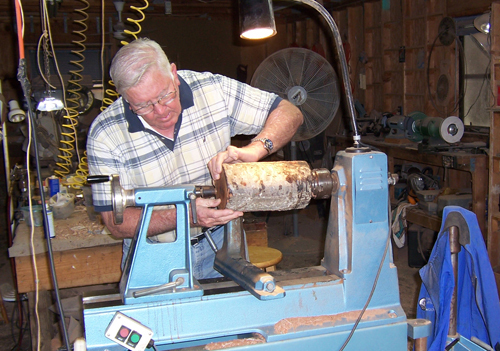 Starting as a hobbyist craftsman in 1992, Bill began as a simple wood turner selling his work in craft shops and quickly developed a following of regular customers who collected his work. Of great importance from the very beginning was the “feel” of the wood when it was touched; a sense of warmth and smoothness that makes you want to pick up the piece and hold it. The work evolved as he studied techniques of other nationally and world known wood artist,. 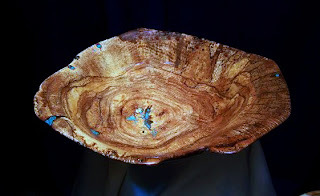 Changes began to come when he added wood carving to modify the round appearance of bowls turned on the lathe and allowed more unusual shapes to be formed. Later the inclusion of some turquoise was added as a touch of interest. Then while attending a woodturning symposium in Provo Utah, he visited a mineral store and discovered the possibility of incorporating other semi precious stones into the wood forms. Mastering the technique of adding stone [a very hard material] to the softer wood base was soon solved with special sanding materials and diamond tipped cutters. Today stone of many types i.e.turquoise, malachite, blue lapis, chrysacola, fuchsite, coral, alabaster and others is used to enhance the features of wood making Bills’ artistic works even more beautiful and unique.